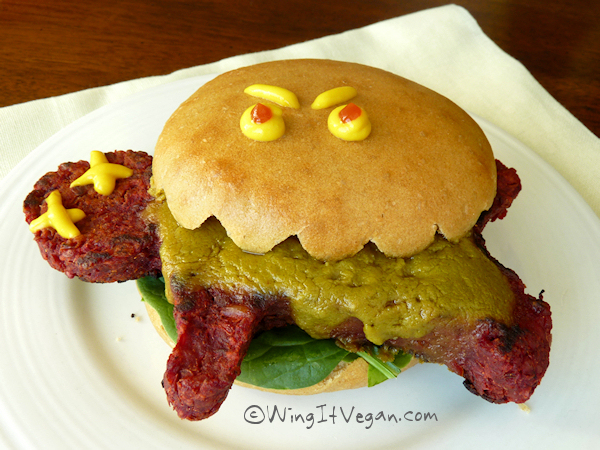 Wing It Vegan: Halloween Man-Eating Burgers! Run! Run!!! RUN!!! The Man-Eating Burgers are here! They will spare no one! Look at what happened to this poor guy! 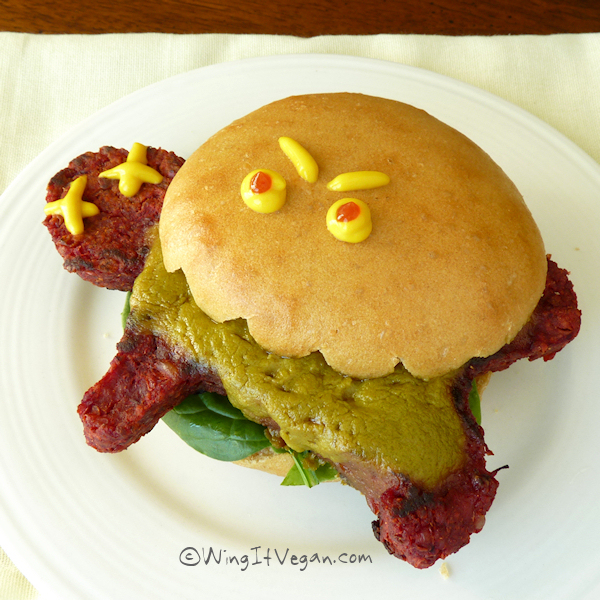 Some of you might remember the original Dead Man Burger from Halloweegan 2010, but this time the guy has green goo oozing out of him. Tasty! The green goo is of course that tasty Coconut Milk Cheddar that I am so smitten with, but this time I blended a couple of handfuls of spinach with the coconut milk before I started working on the cheddar. I added a bit more of all the seasonings that the recipe calls for because I didn't want it to taste like spinach - it doesn't! 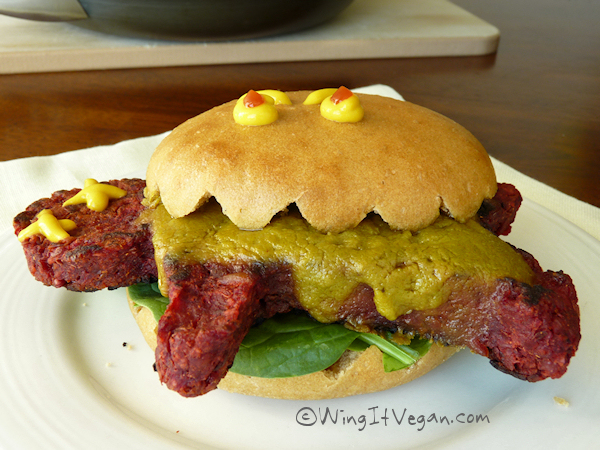 The patty is of course the same Beet Burger recipe I've been going on and on about since I first made it. I shaped the patty inside a greased gingerbread man shaped cookie cutter, just like I did last week for my Spooky Dinner. Check out the Spooky Dinner post for a video with more details. This is probably my favorite Halloweegan food of all time! It's fun and fairly easy to make. I made a step by step video that shows how to assemble the burger. If you need help making the gingerbread man shaped patty check out my Spooky Dinner post and video. I forgot to squirt some messy ketchup around the "teeth". Oh well. I get very discombobulated when I am cooking and making a video at the same time. Walk and chew gum at the same time? Me? Not without biting my tongue and stepping on my own feet! 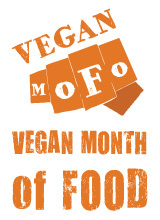 The end of Vegan MoFo is almost here! Only a few more days of insanity! Are you going to any fun Halloween parties this weekend? Dogs in Halloween costumes excepted, this might be the most adorable thing I've seen all week! So cute, River. I am in need of cheer, so glad I found your post. I just happen to have a photo of a cat in a Halloween costume, but this still trumps it. It gives new meaning to the word, "toothsome". 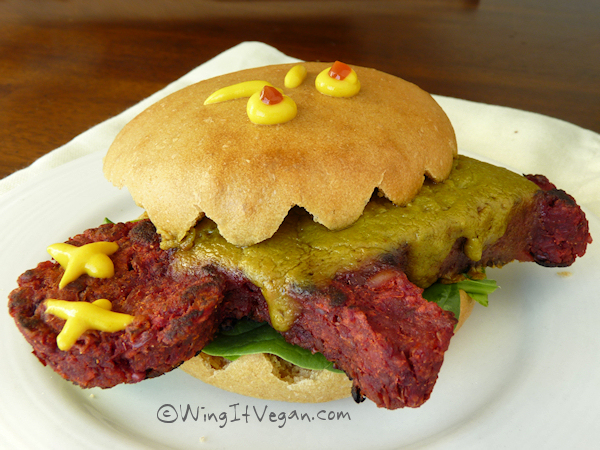 Perhaps we can have beet burgers in the shape of hearts for valentine's Day. Or is that too gruesome? Love the man-eating burger and your video, especially when the bun chomped it's way towards the camera! You're so clever and creative, hun! No really, that's what i call real Halloween(gan) food! Brilliant! The green goo is awesome.